Earlier this week on The Reader Online we gave a summary of the ‘Living Well with Dementia’ session at Shared Reading for Healthy Communities, this year’s National Conference of The Reader Organisation. The session presented some thought-provoking examples of how shared reading can impact upon people living with dementia, leading on the positive findings from CRILS‘ research publication, A Literature-Based Intervention for Older People Living with Dementia. Each week, our Project Workers and many of our volunteers are sharing reading with older people and those living with dementia, providing time and space to relax, interact with others and engage in meaningful, stimulating activity. 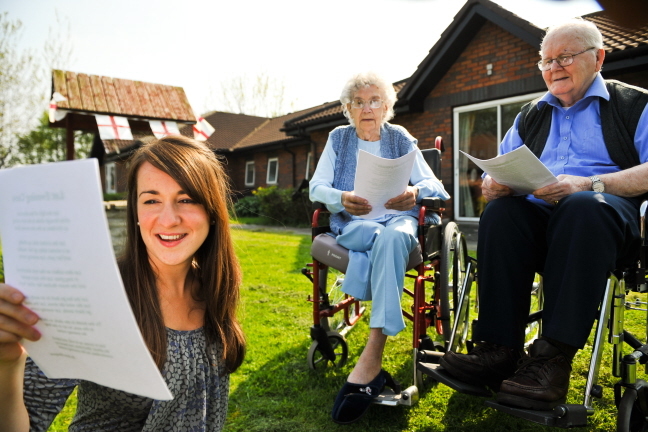 Not only do residents get to connect with great literature but their mood and concentration improves, with personal memories and stories beginning to emerge. 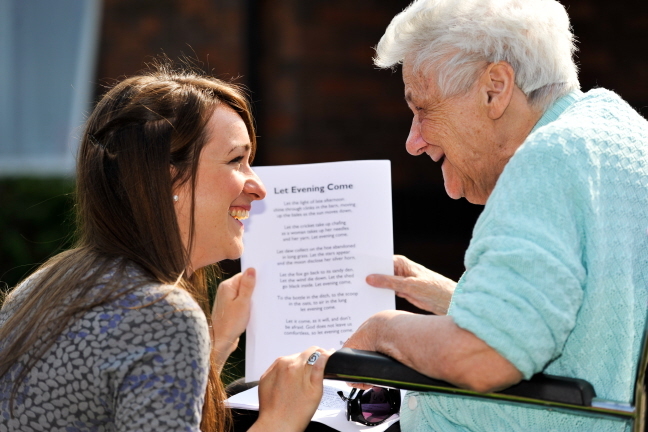 Here’s one of our Reader Stories from Betty, a resident in a care home – just one example of how taking part in shared reading can prove to be ‘a window on the world’ and much more for people living with dementia. Betty is a regular at the Care Home 1 group. She is 93 years old. Since before Christmas, Betty’s health seems to have deteriorated, but she is still keen to come to the group and share poetry. One week when she was not in the group I was told she was in the quiet lounge and didn’t want to move. When I went to say hello however, she was most put out and said ‘I would have come, I love the poetry.’ So we read a couple of poems together, just the two of us. Betty particularly likes poems about the sea. As a child she lived in Flint in Wales, but always visited Talacra on the coast and has clear memories of it. Eventually her father built a bungalow at Talacra and she recalls many holidays, including a sad one when some young men were drowned. Betty also has a strong memory of being cut off by the tide and being ‘guided’ back to shore by a dog. She never knew what became of the dog. Another great favourite of Betty’s is ‘Pedlars’ by W D Rands. She remembers it as one of the first poems she learned as a child. She and the other members of the group had a really good conversation about seeing gypsies travelling in traditional wooden caravans and remembering the tinkling sound they made as everything inside moved around. Betty had a happy marriage, but does not seem to have had children of her own, although she fostered them. She also loved to garden and seems knowledgeable when we read poems about nature or gardens. Betty has plainly always loved to read. She says her mother loved poetry and she thinks that’s where her love of it originates. She recalls a mobile library (a horse and cart) coming to her childhood home in Flint. Her mother would keep the more ‘grown up’ books on a high shelf, but as they got older, Betty and her siblings were allowed to reach for these. Find more of our Readers’ Stories on our website, where you can also discover more about shared reading with older people and people living with dementia.